The number of people with lung cancer is increasing every year, so to identify the symptoms of lung cancer is conducive for treatment. 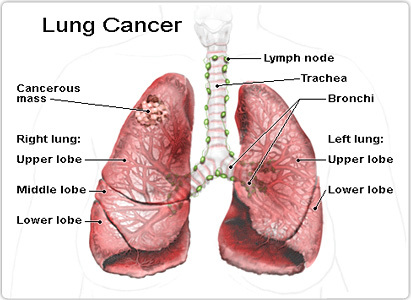 Lung cancer, also known as bronchogenic carcinomas because they arise from the bronchi within the lungs, is broadly classified into two types: small cell lung cancers (SCLC) and non-small cell lung cancers (NSCLC). This classification is based upon the microscopic appearance of the tumor cells themselves, specifically the size of the cells. These two types of cancers grow and spread in different ways and may have different treatment options. NSCLC are the most common lung cancers, accounting for about 80% of all lung cancers. The 3 main types of NSCLC are adenocarcinoma, squamous cell carcinoma, and large cell carcinoma. There are usually no symptoms or warning signs in the early stages, thus it is easily ignored, resulting in delay of treatment. 1. Cough: there are about two thirds of patients have cough, which is the most common symptom of early lung cancer. It can be manifested as mild dry cough, severe cough, lingering cough or cough at night. 2. Hemoptysis (Coughing up blood): it is also a symptom of early lung cancer and it is more obvious in male smokers. It is manifested as coughing up phlegm with blood or intermittent bloody sputum, and having repeated infections somewhere in the region of lungs. 3. Chest pain: it is a symptom in about 30 percent of people with lung cancer. If the tumor is close to lung membrane, the pain can be dull or vague and cough intensifies when breathing or coughing. If cancer has invaded lung membrane, persistent pain can be caused. 4. Fever: fever due to lung cancer is a kind of cancerous heat which is mostly caused by inflammation that tumor blocks bronchus of lung, causing inadequate drainage. The fever is generally below 38 degree, ineffective to antibiotic treatment, and tends to develop repeatedly. 5. Chest distress and shortness of breath: they are most common symptoms of early lung cancer. They usually result from a blockage to the flow of air in part of the lung, collection of fluid around the lung (pleural effusion), or the spread of tumor throughout the lungs. 6. Clubbed finger: known as drum hammer finger, it is manifested as enlargement of the first joint of fingers and toes, protruded and curved of nails, and pain. If you find yourself having those signs, you need to pay attention to prevent lung cancer. 7. Arthritis: it is manifested as wandering and burning pain of the joint of elbow, knee, ankle, wrist, and finger, inability to use the hand or walk. Therefore ,oncologists from St. Stamford Modern Cancer Hospital Guangzhou advise you to take timely checkup as soon as the above symptoms occur. The sooner is the detection, the better the efficacy.